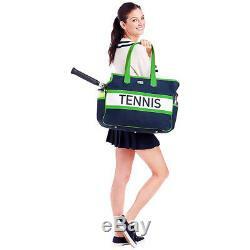 Ame & Lulu Tennis Varsity Court Bag - Navy/Green Racquet Bag NEW. Channel your vintage tennis style with the all NEW Varsity Court Bag. With custom tennis screen print and classic tennis colors, this bag is an eye catcher on the court. Canvas with a durable water repellent finish. Interior zip pocket fits two oversized racquets. Protective metal feet at base. 17"L x 6.25"W x 14H. 17 x 14 x 6.25. Whether you are seeing Rome for the first time, loading up the kids to see family for the holidays, making an important business trip, or just going out with friends, eBags is the first step of your journey. In 1999, we set out to become the worlds most loved and trusted online destination for bags and all things travel - a natural answer to where can I find my perfect bag? Boxes, military APO/FPO addresses, U. It is at this time that we will begin processing your order. Due to the number of manufacturers we deal with, processing times will vary from item to item. With this number, you have 24-hour access to monitor the progress of your package as it is in transit to you. If you are not completely satisfied with your eBags product at any time, we will happily make it right. 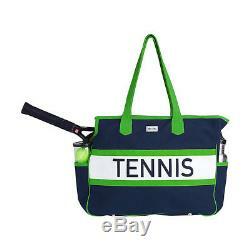 The item "Ame & Lulu Tennis Varsity Court Bag Navy/Green Racquet Bag NEW" is in sale since Saturday, July 7, 2018. This item is in the category "Sporting Goods\Tennis & Racquet Sports\Clothing, Shoes & Accessories\Other Racquet Sport Accs". The seller is "ebags" and is located in Englewood, Colorado. This item can be shipped to United States, Canada, United Kingdom, Denmark, Romania, Slovakia, Bulgaria, Czech republic, Finland, Hungary, Latvia, Lithuania, Malta, Estonia, Australia, Greece, Portugal, Cyprus, Slovenia, Japan, China, Sweden, South Korea, Indonesia, Taiwan, South africa, Thailand, Belgium, France, Hong Kong, Ireland, Netherlands, Poland, Spain, Italy, Germany, Austria, Israel, Mexico, New Zealand, Philippines, Singapore, Switzerland, Norway, Saudi arabia, Ukraine, United arab emirates, Qatar, Kuwait, Bahrain, Croatia, Malaysia, Brazil, Chile, Colombia, Costa rica, Dominican republic, Panama, Trinidad and tobago, Guatemala, El salvador, Honduras, Jamaica.